The impetus for the Infrastructure for Spatial Information in Europe (INSPIRE) initiative is the need to develop interoperable architectures and standardized interfaces between geospatial implementations throughout Europe to provide a means for addressing common environmental concerns. While much data has been collected, compatibility between the various installations is sometimes limited, which significantly affects data value, increases data redundancy, and produces somewhat isolated implementations. Recognizing the need to resolve the problem and unify its spatial data infrastructure (SDI), the European Union (EU) began developing the INSPIRE initiative in 2002 with the goal to make geospatial data available for the formulation, implementation, monitoring, and evaluation of European Community policy making. Recently, the European Parliament and Council formally adopted the INSPIRE Directive, which requires that EU member states bring into force laws, regulations, and administrative provisions necessary to comply with the INSPIRE Directive during the next two years. This transition phase will be followed by full EU implementation, which is expected to last until 2019. INSPIRE is intended to support the development of a comprehensive European SDI built on the SDIs operated by EU member states and other constituent information-sharing communities. Using open source technologies, the integration of the existing SDI servicestogether with the creation of new serviceswill enable European SDI participants to exchange spatial information as widely as possible. Potential users include policy makers, planners, and managers, as well as private organizations and residents from EU member states and beyond. Currently, a comprehensive set of implementation specifications is being drafted by teams of experts in the areas of metadata, data specifications, network services, data and service sharing, and monitoring and reporting. The Spatial Data Infrastructures Unit of the European Commission's Joint Research Centre (JRC) is acting as the technological and scientific advisor for the INSPIRE implementation to guide the drafting teams. Esri has reached a cooperative research and development agreement (CRADA) with JRC to contribute more effectively to understanding and resolving issues in the field of spatial data infrastructures and the interoperability of geospatial data. Observes Steve Peedell of JRC, "The preparation of the INSPIRE Directive has been done with widespread stakeholder involvement and has significantly raised awareness of interoperability and SDI issues in Europe. Now that the directive has been adopted, it is vital that Esri, as a leading GIS vendor, support the required interoperability specifications and standards, and we are happy to cooperate on these issues. As an Esri customer itself, JRC needs to know that it can build interoperable geospatial services that are compliant with the requirements of INSPIRE using standard off-the-shelf tools." INSPIRE will not only strengthen the knowledge base for European environmental policy but also make that policy more accessible to its citizens, as well as stakeholders and decision makers. The directive covers a wide range of strategic information that directly or indirectly affects the environment. At present, this type of data is not always available to implement effective environmental policy. The new directive sets obligations for the public authorities of the EU member states concerning the accessibility and sharing of the data they collect. 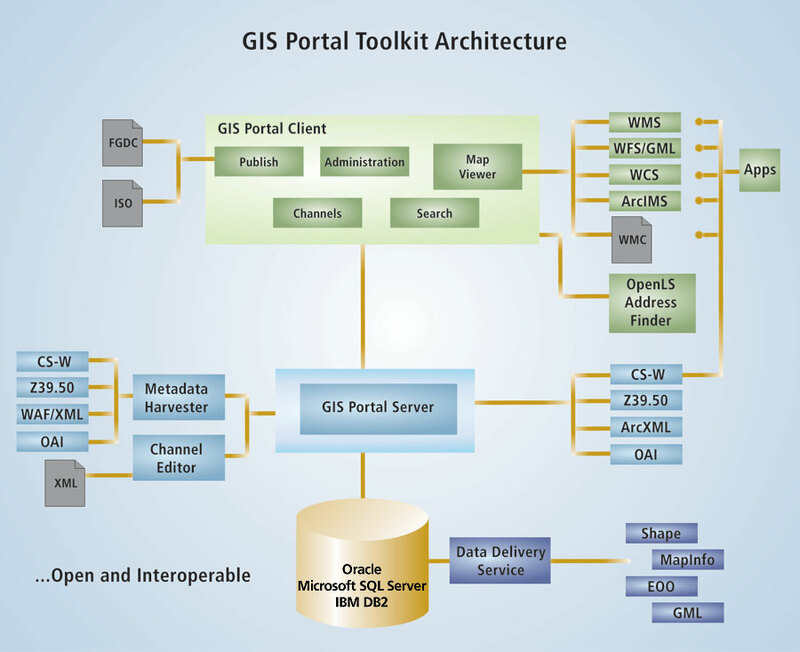 To facilitate the implementation of an SDI, Esri has introduced the GIS Portal Toolkit, a standards-based technology and services solution. Based on Esri's GIS server technology, it provides a cost-effective means to get a geoportal up and running quickly by providing all the tools and templates necessary to implement a Web-based mechanism for the posting and discovery of spatial data made available by participating spatial data authors. In addition, there is a stand-alone Harvesting Module for the toolkit that is used to harvest, validate, and publish metadata information from one data repository to another. This facility performs automatic searches for data that is required for a specific query or analysis. Comments Esri developer Marten Hogeweg, "The GIS Portal Toolkit provides a mechanism for organizations to advertise to and share their geographic resources with other agencies who may benefit from these resources. Traditionally, these resources were downloadable datasets or map services available for viewing, but we do see a need to also include globes, models, tools, tasks, symbology definitions, and other types of resources GIS professionals may share with each other. Since both data providers and consumers may use different GIS technologies, supporting interoperability specifications, including, but not limited to, those developed by the Open Geospatial Consortium, Inc. (OGC), are a key element of the GIS Portal Toolkit." Hogeweg states further, "We also aim to increase the integration of the resource discovery process with GIS business processes by developing extensions to ArcGIS Desktop (ArcMap) and ArcGIS Explorer that can interact with a catalog of geospatial resources managed using the GIS Portal Toolkit and made accessible through OGC Catalog Service for the Web interfaces. In this dynamic world of service specification and interaction, it is of utmost importance for interacting with the research community through agreements as we currently have with JRC." In Italy, the Regione Lombardia is supporting its GIS strategy by setting up the regional SDI as a node for INSPIRE. It will involve both local public administrations and private companies in the process of disseminating and sharing geographic data and services that are already widely available. The core of the regional SDI is the Lombardia GeoPortal, where users can publish or search for geographic data, applications, and services. The main component of the geoportal is the Metadata Catalog of Data and Services, which has been implemented to be compliant with the international standards ISO 19115 and ISO 19139. In addition, the geoportal offers general services, including map viewers and tools for downloading and coordinate transformations. In the future, other services will be added to support the requirements of an increasing number of users. States Marco Panebianco of Lombardia Informatica S.p.A., who is managing the geoportal project, "The new geoportal solution has been designed to be easy to use even for non-GIS users, aiming to be a reference point for everyone interested in geographic information and services related to Regione Lombardia. "It represents a powerful and effective solution to support Regione Lombardia in the process of setting up the regional SDI, involving the other public administrations (provinces, municipalities, mountain communities, etc. ), and giving visibility and access to their georesources and metadata. Moreover, in the INSPIRE perspective, we are experiencing the interoperability of the regional catalog of data and services with other catalogs both at the national and European levels." The Lombardia GeoPortal was implemented by customizing Esri's GIS Portal Toolkit to be compliant with both the Italian and the INSPIRE metadata profiles. The geoportal overlays the Regional Enterprise platform for Geographic Information Services (REGIS), which consists of a technological infrastructure based on ArcSDE, ArcIMS, and ArcGIS Server, as well as basic services, all used like interconnecting LEGO blocks to build geographic solutions. Concludes Guenther Pichler, business development manager at Esri, "Following our long tradition of supporting the establishment of SDIs within the global spatial data infrastructure initiative, Esri is pleased to contribute open, standards-based, state-of-the-art GIS technology to integrated spatial information services for Europe. Ubiquitous and interoperable access to spatial information from a wide range of sources is key for decision making. It will make European governance more efficient and effective, specifically regarding the sustainable management of resources and the environment." For more information, contact Guenther Pichler, Esri-Europe, Middle East, Africa Group (e-mail: gpichler@esri.com).